Learn how to fully utilize the embroidery component of your embroidery machine. 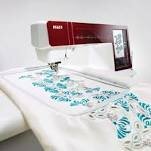 Free if you purchased your machine at Quilt Connection. Class is free if you purchased your machine from Quilt Connections.